Medicare was originally designed to protect beneficiaries from the financial burden of acute episodes of illness. As lifespans lengthen, Medicare must adapt to serve beneficiaries with substantial long-term physical or cognitive impairment who need personal care assistance. These beneficiaries often incur high out-of-pocket costs for Medicare-covered services as well as home and community care not covered by Medicare. This latter category of care is often key to continued independence. 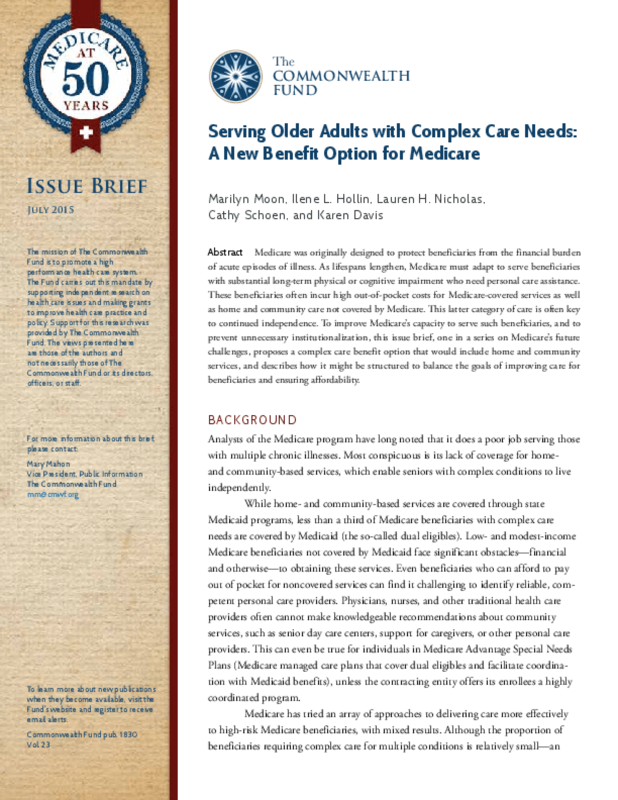 To improve Medicare's capacity to serve such beneficiaries, and to prevent unnecessary institutionalization, this issue brief, one in a series on Medicare's future challenges, proposes a complex care benefit option that would include home and community services, and describes how it might be structured to balance the goals of improving care for beneficiaries and ensuring affordability.